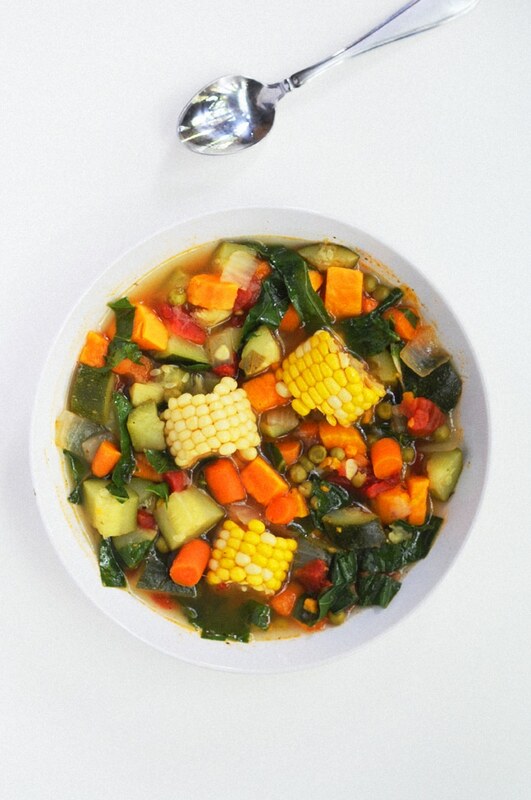 This all in one, Low-carb, Gluten Free and Vegan, Summer Vegetable Soup with Farmer’s Market Vegtables is just what I need for a weekday dinner. I love that all the veggies are out for the summer and we can load up for a healthy meal. 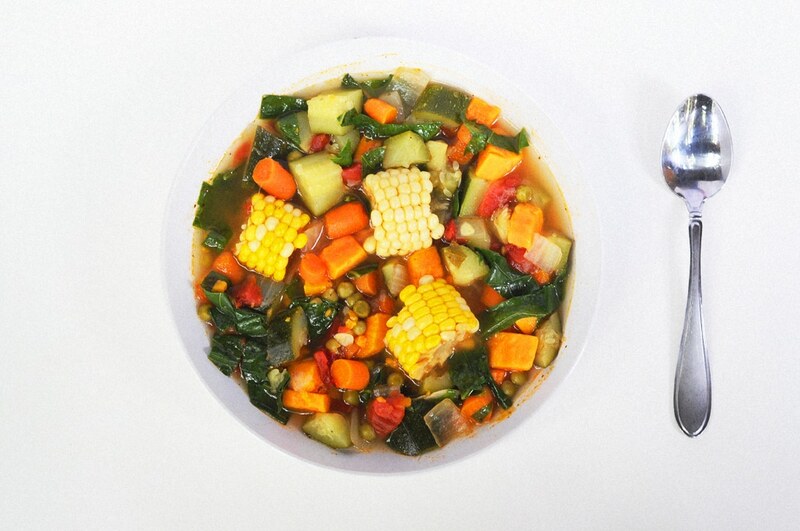 This Low-Carb, Gluten Free and Vegan Summer Vegetable Soup Recipe is easy to make for a No Meat Free Monday. 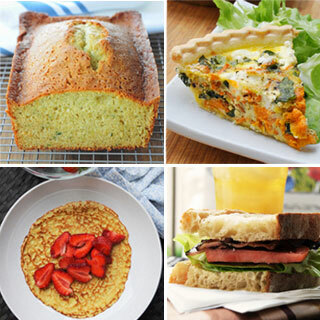 One trip to the farmers market and you will have everything you need for this recipe. As we enter August and the summer comes closer to an end, our veggies are ripe for picking at this time of year. 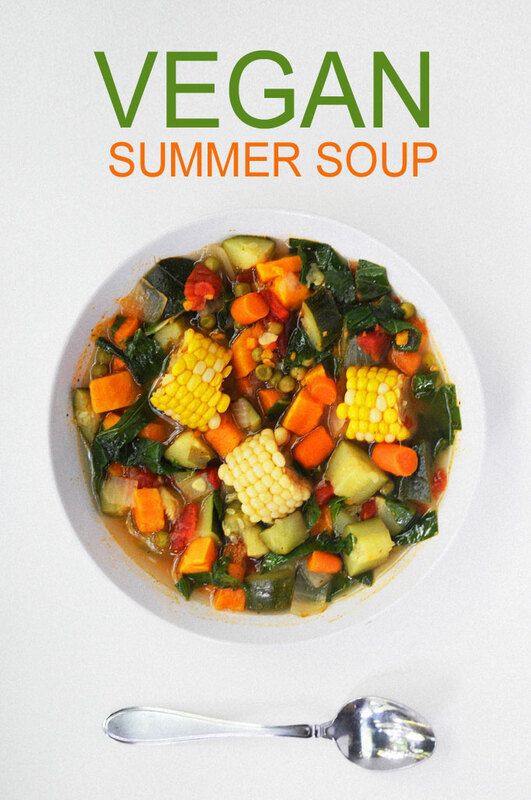 Which makes it the perfect season for vegan summer vegetable soup recipe.You can see at the stands of the farmers market with all the veggie colors in abundance, not to mention the prices are down. When prices go down on fruit and vegetables that means there in abundance and it is in full bloom for the season. One of my favorite thing is the Portuguese kale that I have come to love. The leaves are bigger and the taste is not as bitter. 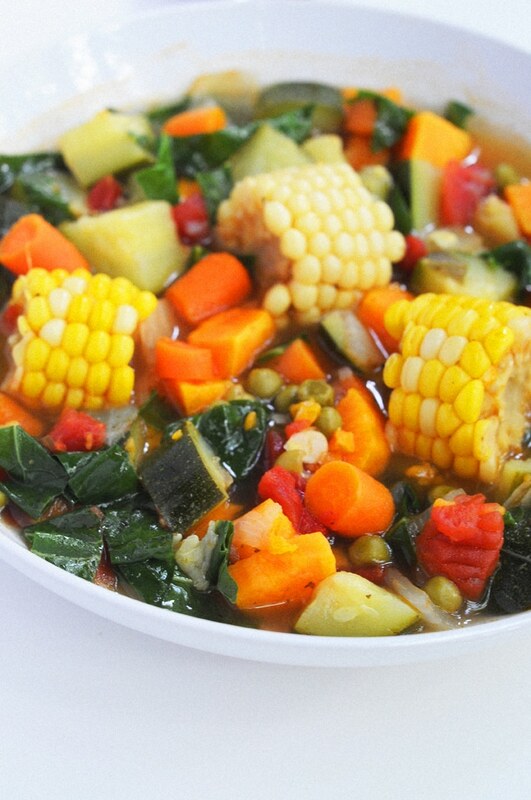 It leaves the soup with the taste of sweetness but most all it’s super good for you. Not to mention I grew up on this stuff with my mom making soap every weekend for the week. Before every meal you had your soup first and needed to finish it before you started your meal. She never made a big deal to finish your plate but you had to finish that soup first. 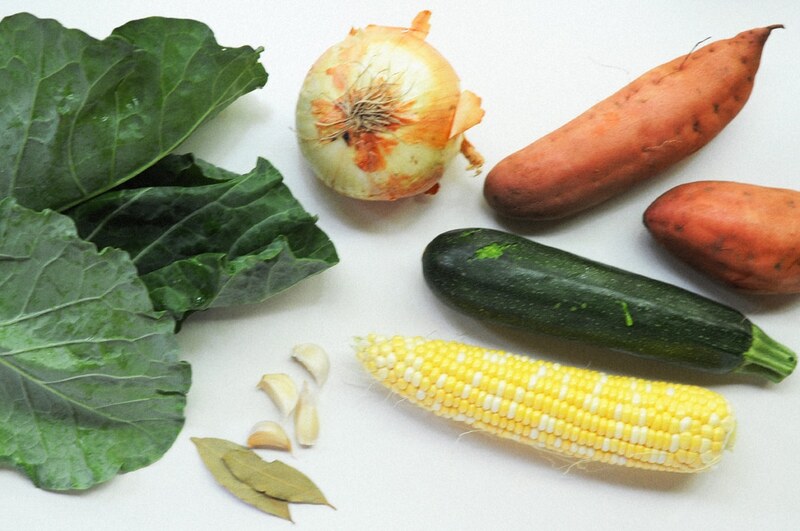 As I have gotten older, I am so thankful that my mother had the foresight of eating lots of veggies. The vegetables were really what made you healthy. None of the soup she made really had a lot of meat but tons of vegetables. The other thing I noticed about having a bowl of soup before dinner, it’s almost impossible for me to over eat anything else for the night. I feel full and usually more satisfied with my meal. Kale – low in calorie, high in fiber and has zero fat. One cup of kale has only 36 calories, 5 grams of fiber and 0 grams of fat. Zucchini – squash a high content of omega-3 fatty acids, zinc, niacin, and protein. 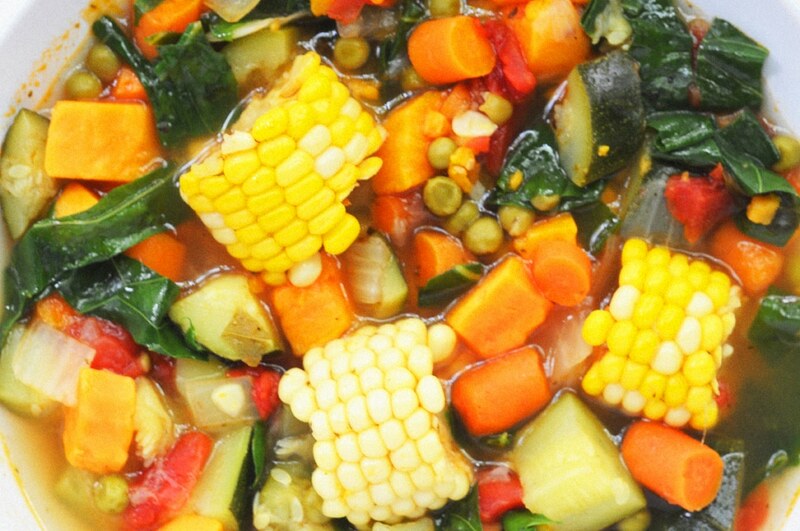 A healthy vegan soup for a family weekday dinner. Chop your our sweet potato, carrots, zucchini into bite sizes and set aside. In a pot pour your olive oil and saute onion, garlic, bay leaf for 4 minutes. 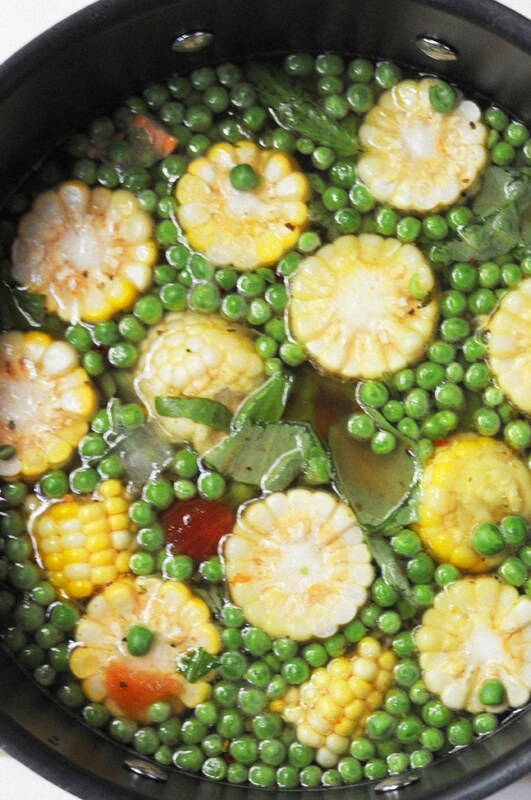 Place the vegtables in the pot and mix around for 3 minutes. Pour the can of tomatoes and water with the bouillon cube. Cook until it boils and then turn on medium heat for 20 minutes. Place the corn and kale in the pot after and cook for about 10minutes or until the corn is done.